Student Ambassadors volunteer for 38th Raul Jimenez Thanksgiving Dinner prep. Correction: For more information on becoming a NSO ambassador, contact Marisa Martinez or Monica Garcia at 210-486-0129. There were 25, 000 people fed on Thanksgiving Day. While most students are focused on balancing their classes as finals approach, seven student ambassadors for New Student Orientation and their two advisors, Monica Garcia and Maria Martinez, slid on plastic aprons over their heads, and collected their hair in mesh hairnets as they dressed to volunteer for the preparation of the 38th annual Raul Jimenez Thanksgiving Dinner, Nov. 19 at the Henry B. Gonzales convention center. “I decided this one I could totally make the time for, even though I work two jobs and I had to wake up super early to get here,” said student ambassador and psychology sophomore, Brett Douglas, as he explained that one of the requirements to become a student ambassador is perpetual volunteering and attending of college functions throughout the semester. In addition to volunteering and event help on campus, students must be interviewed by the program advisors, maintain a minimum 3.0 GPA, undergo a leadership training and be enrolled in a minimum of six hours at this college. The dinner, after being prepared by volunteers throughout the holiday week, is held on Thanksgiving Day, and according to www.rauljimenez.com, is meant to serve the lonely senior citizens and “less fortunate” people of San Antonio who can’t afford a Thanksgiving dinner themselves. The dinner is purely supported and financed by charity and donations coming from community members and businesses in San Antonio and the surrounding area. “Everyone that is working is volunteering,” said sous chef Eva Fernandez during an interview. 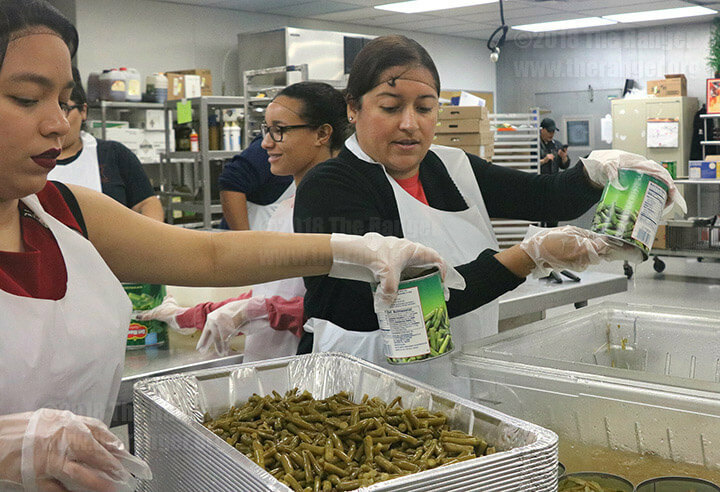 During the preparation of the food, hundreds of volunteers ran around dodging each other as they carried large cans of green beans, cranberry sauce, plastic tubs full of drained green bean juice and trays full of 1-inch blocks of butter. Those who were not transporting food were preparing it for cooking in an assembly line. Most of the student ambassadors were tasked with the cleaning, opening, or draining of green bean cans, while other volunteers from schools and professional corporations were stationed to mash cranberry sauce, pull apart turkey carcasses, or prepare green bean casseroles with butter, salt and pepper. Fernandez said at that time there were approximately 4,000 counted pounds of green beans, over 9,000 pounds of turkey and more uncounted amounts of other sides that weren’t out to be cooked yet, like stuffing and sweet potatoes. Though the number of turkeys was spot on, the final count was 650 pounds of gravy, 4, 688 pounds each of sweet potatoes and cranberry sauce, 6,250 pounds each of green beans and stuffing, 3000 pies and 25, 000 dinner rolls. The food donated fed 25, 000 people in need. The volunteering, as much as the dinner itself, is deeply rooted in San Antonio and its people. Some, like Cynthia Cooke and her son, Stephan Cooke, have only volunteered for a couple of years, while others like Antonio and Maria Trevino have been volunteering in the kitchen for over 30 years. The student ambassadors for New Student Orientation are tasked with giving campus tours, helping new students with registration and answering frequently asked questions. They also conduct fundraisers for campus activities and donations for underprivileged students in need of supplies. For more information regarding the student ambassador program call student success Coordinator Joseph Liedecke at 210-486-0137 and for more on the dinner, visit www.rauljimenez.com. For more information please on becoming a NSO Ambassadoe please contact Marisa Martinez or Monica Garcia at 210-486-0129. Joseph Liedecke works with Civic Engagement and not New Student Orientation. Two different ambassador programs.